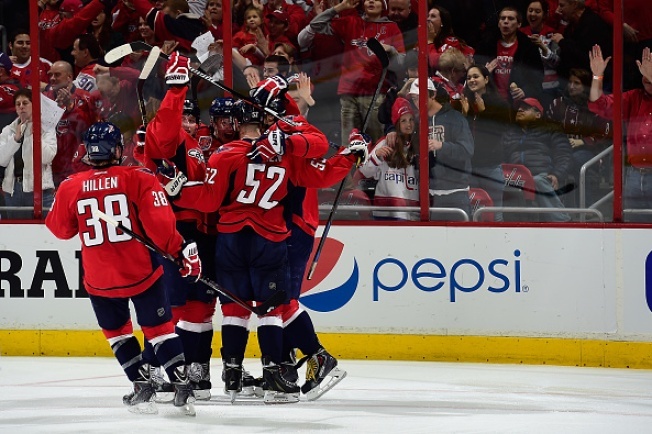 The Washington Capitals celebrate Andre Burakovsky's third-period goal against the Florida Panthers. Call it a New Year's resolution. Last month, Washington Capitals coach Barry Trotz approached forward Andre Burakovsky, informing him that he would receive a first-line opportunity once the enormity of the 2015 Bridgestone NHL Winter Classic had subsided. The 19-year-old barely played in December, scratched in eight of Washington's 13 games, which Trotz knew had to be "devastating" to a player of Burakovsky's ability. He recently admitted that he may have been "too ambitious" in attempting to simultaneously segue both Burakovsky and fellow rookie Evgeny Kuznetsov to center. Washington's long-term vision for Burakovsky remains developing him into a center, but Trotz temporarily abandoned that plan in order to find him meaningful minutes. Against the Florida Panthers on Sunday, Burakovsky joined Alex Ovechkin and Nicklas Backstrom for the first time, skating at right wing. The assignment was foreign yet familiar to Burakovsky, who starred at the position last season in the Ontario Hockey League. He felt that he belonged in such a role, most comfortable when relied upon to manufacture high-end offense, and that the three of them could be dangerous. Ovechkin, Backstrom and Burakovsky were formidable against Florida, sporting the highest on-ice shot-attempt differential at even strength among all forwards. Trotz told Burakovsky before the game not to be intimidated by the star power alongside him, cautioning him that if "Ovi's yelling for the puck, you don't always have to give it to him." Yet there was Ovechkin in the third period, slipping a pass to Burakovsky for a slam-dunk goal in the third period, his first since Nov. 28. "I think we played really good together," Burakovsky said. "We [found] each other good out there. We didn't really have any scoring chances against us, we put pressure on Florida all the time. ... I should be up there, but it's my first year so I just try to do my best. I don't really care where I'm playing, but I want to be up there and right now it feels really good to be there." Burakovsky's performance did not surprise Trotz, who expects the youngster to ultimately become a centerpiece of Washington's future. Burakovsky simply wanted to prove that he could contribute. "I never want to sit in the stands and watch the games," he said. "Of course when I come back, I want to show Coach [I don't] belong in the stands."